Right click on hp logo, uncheck "Hide TitleBar". 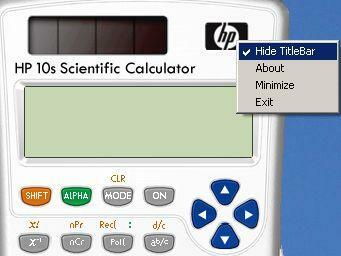 Click ON button to use virtual calculator. Emulador da Calculadora Científica HP 10s. Comprei a máquina e uso em treinamento. Conectar ao Projetor. It appears any positive integer divided by 9 divided by 9 gives either a 1 or 0. try it with brackets or without. Not too accurate as the answer should be 1.234567901. You can get the correct answer by doing 100 x 9^-1 / 9 (100 times 9 raised to power -1 divided by 9). there is a serous flaw in the HP10s emmulator. Type a 1 divided by .81 The answer shown is 1, The real answer should be 1.234567901 . A 10 divided by 8.1 gives the correct answer. 0.81 raised to -1 (reciprocal) works correctly. 1 divided by 0.809999999 works correctly but 1 divided by 0.8099999999 gives the incorrect ans of 1. Does the fault also exist in a real HP10s? I have been using the 1/.81 to check displays on calculators for many years (the result is easy to remember). Comments welcome.